Reported by Hayley Wilson and Michael Abramowitz. 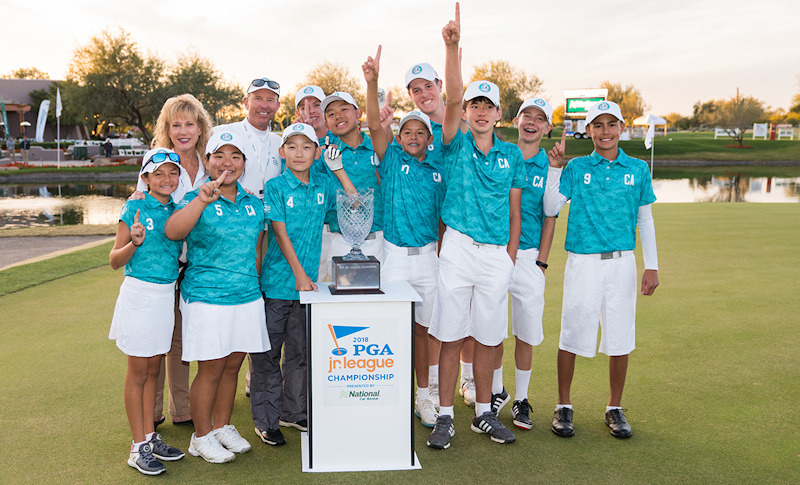 SCOTTSDALE, Ariz. (Nov. 19, 2018) – As the moon rose above Grayhawk Golf Club, Team California (San Diego – Encinitas Ranch Golf Course) went undefeated at the 7th PGA Jr. League Championship presented by National Car Rental, to capture the team’s second crown and the fifth for the Golden State. The highlight of the match came early when Minnesota’s Cash Dragich, 14, of Blaine, made a remarkable chip off the side of a hill from 80-feet out. The ball rolled along the ridge and into the cup for an eye-popping eagle. California answered the bell with a remarkable 30-foot eagle of their own by Ryan Abuan, 14, of Temecula.